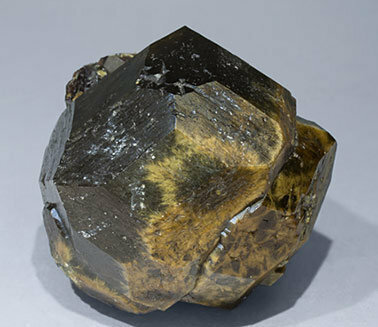 Group of very sharp dodecahedral Andradite crystals, one of them clearly dominant. They have a dark brown color. 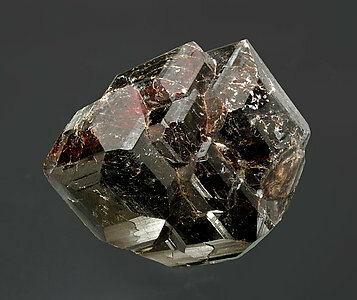 Group, on a rocky matrix, of dodecahedral crystals finely beveled by the trapezohedron, with a dark brown color, translucent and bright. 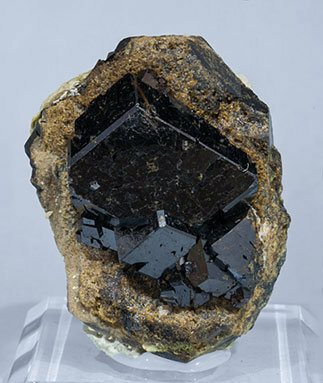 A very large Andradite crystal with smaller satellite crystals at its base, showing very well defined faces of the dodecahedron and the trapezoedron. They are bright, with a dark brown color with yellowish areas. A new locality for Andradite that strangely has the same name (Asbestos) as the Canadian source. The dodecahedral crystals, which are very well developed, have edges that are chamfered. The color is deep and the brilliance is good. These characteristics make them notably different from Andradite from other localities. 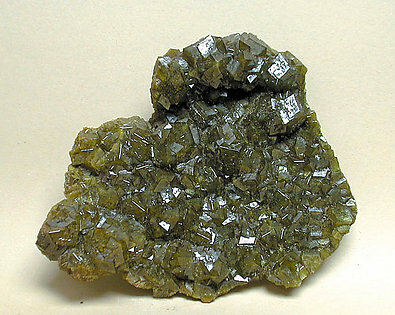 Group of dodecahedral crystals, of well defined faces and edges. They have excellent luster and creamy color. 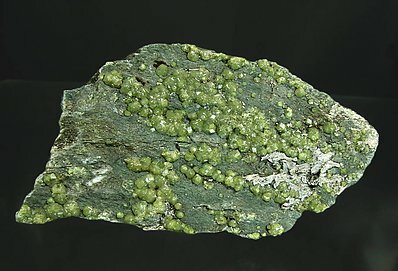 On the lower part there are a few crystals of Epidote. Notable for the locality. Crystals reach a considerable size and have an excellent luster. They show equal development of rhombohedral and trapezohedral forms, with some other faces of the cubic system. One of the crystals has a contact on one of its faces. A good sample from this classic American locality. 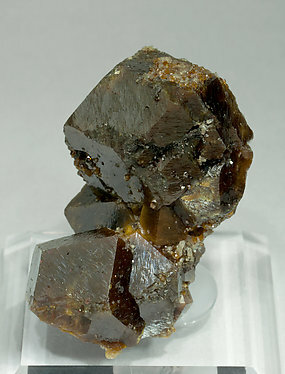 Very aerial group of dodecahedral Andradite crystals with very well defined faces and edges, a dark Brown color and good luster. 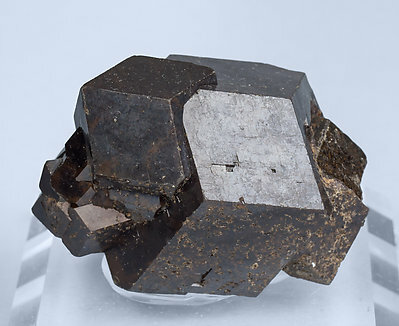 They are partially coated by small Quartz crystals and a second generation of dodecahedrons of the same Andradite. The sample is from a not well known Mexican locality. A super classic from a classic European locality. 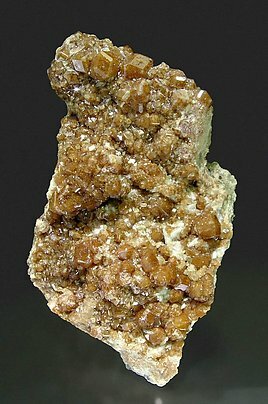 Crystals are trapezohedral, brownish and form the typical dense aggregates for which the locality is known. 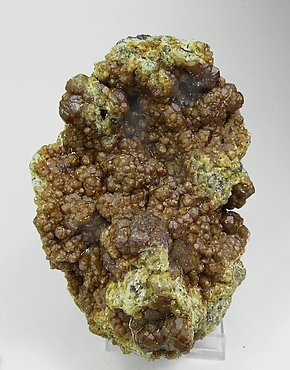 A colorful and slightly iridescent Andradite Garnet from an uncommon locality. A good classic which is hard to find. The Italian Demantoids are really good, but this one does not miss the mark by far, transparent, aerial on the matrix of white calcite. 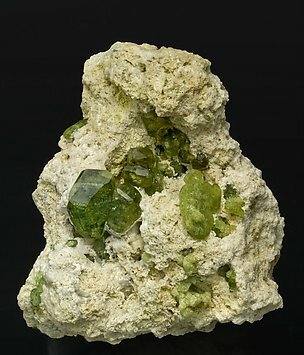 Andradite (demantoid variety) crystals on matrix, two of them clearly dominant, with the forms of the trapezohedron, dodecahedron and cube. They are bright and have a very intense and deep green color. A novelty in Ste. Marie 2009. 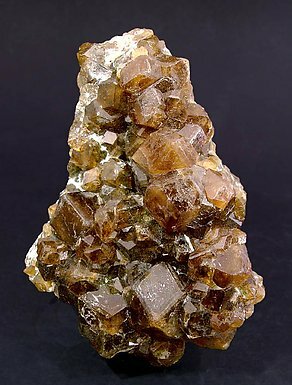 Group of crystals with a dominant dodecahedron and the faces of a trapezohedron on the edges. 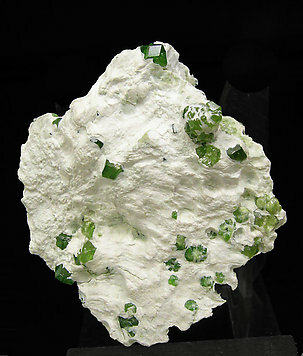 The crystals, on matrix, are very clear and bright, have a good green color and a curious flattened shape. 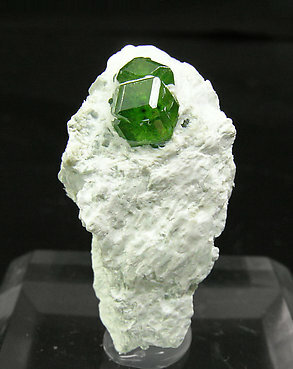 The locality was not well known until recently, and habit of the Demantoid is really unusual. This specimen was published in the magazine ‘Le Règne Minéral’ number 90, page 42. 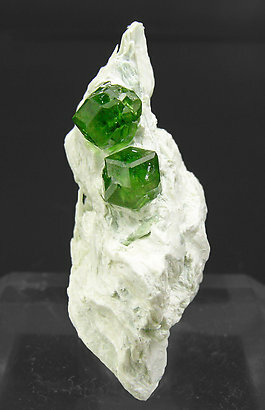 Two crystals on matrix, one of them clearly dominant. They are very rich in faces, with the dominant forms of the dodecahedron and the trapezohedron. 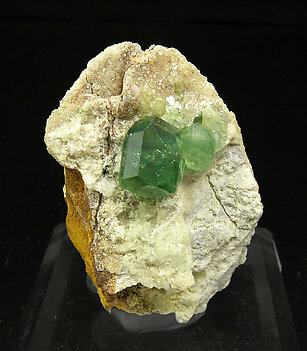 With an intense green color, very bright and transparent. 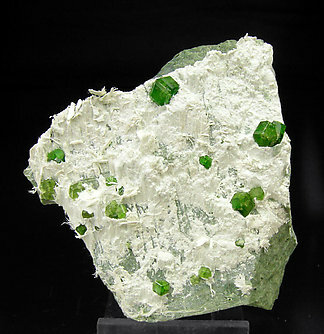 Transparent complex crystals of intense green color, on matrix. They have dominant forms of the trapezohedron and the dodecahedron, but they also show cube faces, small but perfectly visible. Some of the crystals have curious deformations, to the degree that one of them is almost completely flattened. Group of crystals that combine the forms of a dominant trapezohedron with the dodecahedron. The crystals have a very deep color, green with slightly brownish shades. They are very bright and are partially coating a matrix of volcanic rock. The locality is very unusual for the species. On the sample coexist rounded crystals and very well defined ones on matrix. The color is good, classic for the locality. 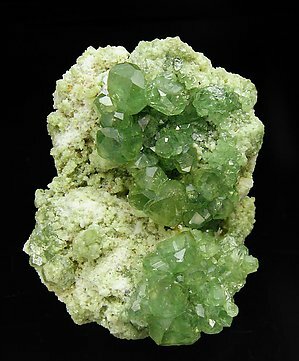 In some areas of the specimen there is fibrous Actinolite. Isolated and clustered crystals that have the dominant form of the dodecahedron modified by the trapezohedron. 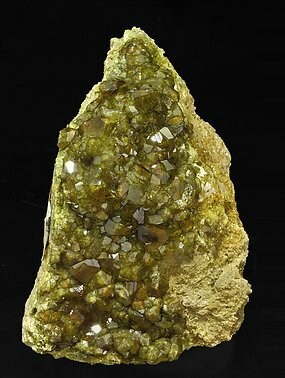 They have an excellent transparency and luster and are a very deep green color that contrasts with a matrix of a white, indeterminate amphibole. The species has been properly analyzed. A novelty in Ste. Marie 2009. The crystals combine a dominant dodecahedron with the trapezohedron. 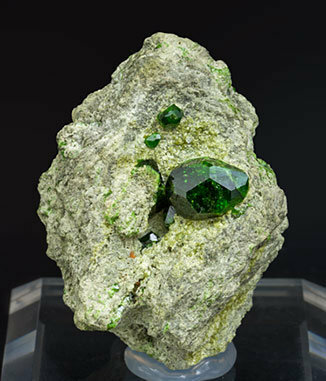 The crystals have a very deep green color, excellent transparency and luster, contrasting with a white amphibole matrix with Serpentine. The species has been accurately analyzed. The crystals combine the dodecahedron and trapezohedron. 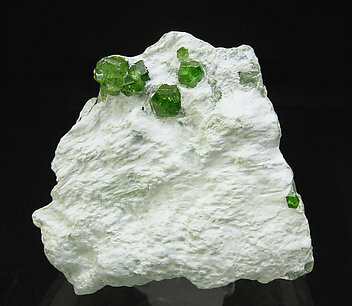 They are transparent, very bright and have deep green color and have very well defined faces and edges that strongly contrast with the white fibrous matrix. A novelty in Ste. Marie 2009. Two crystals that combine a dominant dodecahedron with the trapezohedron. 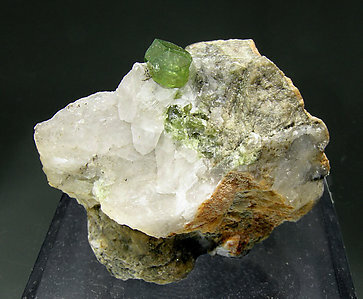 The crystals have a very deep green color, excellent transparency and luster, contrasting with a white amphibole matrix. The species has been accurately analyzed. 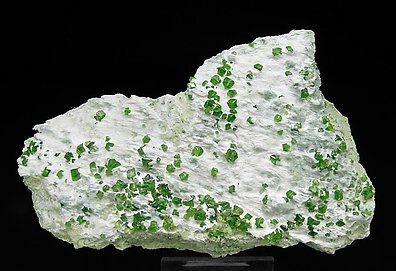 Andradite (demantoid variety) crystals that are distinctly isolated. 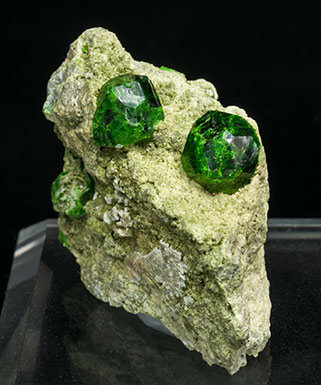 They display very well defined trapezohedral and dodecahedral forms and they are bright, and have a very intense and deep green color. 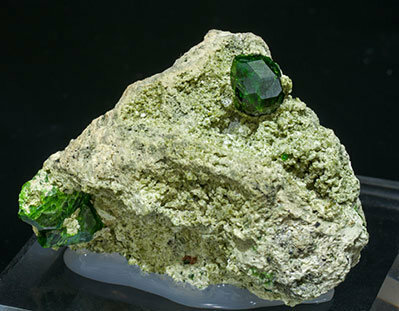 Andradite (demantoid variety) crystals that are distinctly isolated, one of them clearly dominant. 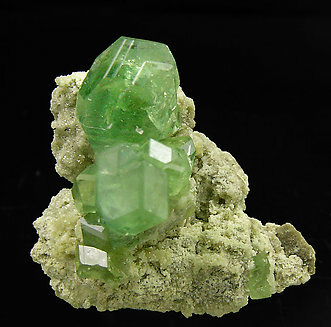 They display very well defined trapezohedral and dodecahedral forms and they are bright and have a very intense and deep green color.